"The measure of some of the parts of this Irish-man, nineteen years of age, shown at Oxford, were communicated to me by Dr. Plot. He was seven feet six inches high, his finger six inches and three quarters long, the length of his span fourteen inches, of his cubit (the distance from the elbow to the finger-tips) two feet two inches, of his arm three feet two inches and a quarter, from the shoulder to the crown of his head eleven inches and three-quarters." Earlier, in 1684, the giant appeared before the Court of Charles II. The amazed king walked under his outstretched arm, an event that Malone mentioned thereafter in his handbills, as in the following: "The Gyant; or the Miracle of Nature. Being that so much admired young man, aged nineteen years last June, 1684. Born in Ireland, of such a prodigious height and bigness, and every way proportionable, the like hath not been seen since the memory of man: he hath been several times shown at court, and his majesty was pleased to walk under his arm, and he is grown very much since, he now reaches ten foot and a half, fathoms near eight foot, spans fifteen inches; and is believed to be as big as one of the giants in Guildhall. He is to be seen at the sign of the Catherine Wheell in Southwark fair. Vivat Rex." More than a century after his death, Nova Scotians still tell stories about the mighty Scottish giant Angus McAskill. After so many tellings, some of the stories no doubt have become somewhat stretched. But others, even some that seem at first outlandish, have been verified by credible witnesses. Though McAskill continued to do some farm work, fishing was his favorite way of life. So, for those who lived on St. Ann's Bay, the giant on his sailboat71 became a familiar sight. He was on such a fishing trip in 1849, when the captain of a Yankee schooner spotted the towering young man at Neil's Harbour and sought to become his agent. After several meetings, the captain persuaded Angus and his family that fame and fortune awaited him in the outside world. For the next four years, he toured Lower Canada, the United States, the West Indies, Cuba, Newfoundland, and apparently England. James D. Gillis says in his book, The Cape Breton Giant, that Britain's Queen Victoria summoned McAskill to Windsor Castle to see for herself if stories of his astonishing height and amazing strength were true. Almon later disputed this audience before the queen because he could find no record of it. But Duncan McAskill, another of Angus' brothers, told Gillis that he indeed appeared before the queen and afterward received from her the gift of a highland costume. for the end of that man is peace". 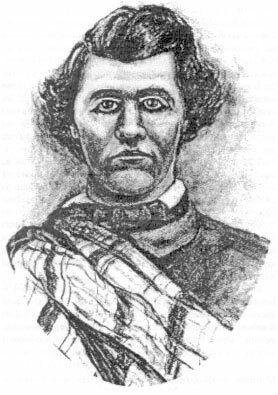 Samuel M'Donald, of Lairg, in Sutherlandshire, who some claimed grew nearly eight feet high, served as a private in the Sutherland Fencibles in the latter years of the American Revolution. Later, after he became a fugleman with the Royals, he so impressed the Prince of Wales (afterward King George IV) that he was made lodge-porter at Carlton House. Big Sam, as he was commonly called, apparently did not take to this kind of life. So, after two years, he resigned and reenlisted with the Sutherland Fencibles with the rank of sergeant. In his Edinburgh Portraits, Kay writes that while Big Sam was in London some tried to persuade him to show himself for money. He declined to do so under his own name, but he agreed to dress up as a female and advertise himself as a "remarkably tall woman." He drew remarkably large crowds and soon became flush with money. Suspicious of his new spending power, Sam's colonel called him in for questioning and learned of the giant's profitable moonlighting. Born in 1578 in the chapelry of Hale just southwest of Manchester, John Middleton grew almost tall enough to look Goliath straight in the eye. He was also endowed with extraordinary strength -a trademark of the true giant. In 1620, Sir Gilbert Ireland, the sheriff of Lancashire, got the giant all dressed up and took him to London to meet King James I. On his return home, the fancy-dressed Middleton had his portrait painted. It is preserved in the library of Brasenose College at Oxord. THE BODIE OF JOHN MIDDLETON THE CHILDE. On December 6, 1856, the Mayo Constitution carried this obituary: "One of the last of the mythical line of Irish giants, in the person of Shawn Nabontree, died at Connemara, Ireland, on Friday last. He owed his sobriquet to his unusual stature, being a man of extraordinary athletic symmetry-namely, seven feet in height, and weighing over twenty stone [280 pounds]. His family, the Joyces, has been for many years one of the wonders of Connemara. He died at the age of seventy, and has left four stalwart sons."